The Austrian brand welcomes 2019 with a lot of work ahead, in its quest to become a reference team within the premier category. Start a new year with an mission intact in KTM: reach the highest. The Austrian team starts a course in which they hope to continue evolving to be able to fight alongside the most competitive brands of the queen class, trying to expand the leadership they maintain in the lower categories of the World Cup. The podium harvested by Pol Espargaró in the last grand prix of the season, motivates a team that will face changes in a structure that will be reinforced in 2019, despite having lost for an indefinite period the one that was one of its most important to face this new challenge. After reaching the four pilots in the queen class with the arrival of Oliveira and Syahrin at Tech3, the list of testers also grew with a Dani Pedrosa, however, after suffering a fractured clavicle due to stress of which it will have to be intervened, complicates the purposes that had been marked since Mattighofen for 2019. The Spanish, which had become the cornerstone of this project due to its trajectory, does not have a certain recovery period due to the complexity of his injury and before his absence, KTM should continue with a progress, which will increase his rate of growth after habe r doubled its number of troops. The fact of having up to six pilots that will be part of the development of the RC16, will favor the evolution of a mount that in the last GP of Spain already left very positive sensations with the performance of a Mika Kalio who finished ahead of the two officials demonstrating how from Austria they go with everything. The performance demonstrated by the test driver on the Spanish track on the back of the 2019 bike, left Pol Espargaró eager to get on it. 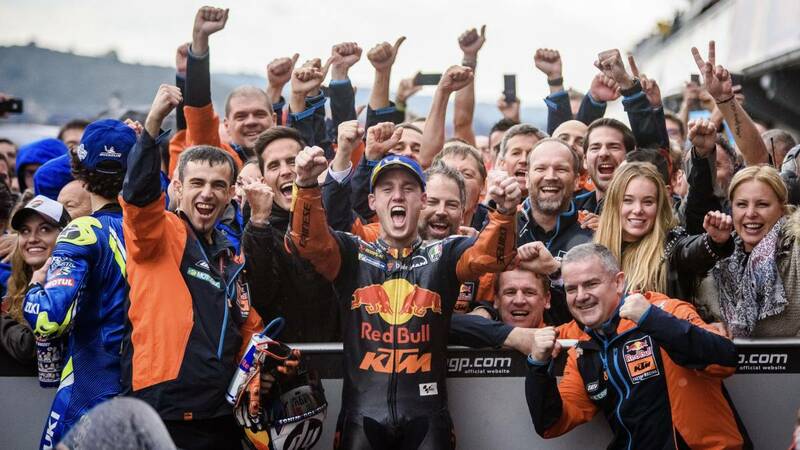 "I want the KTM of 2019 already because it has great potential", declared the pilot after the race in Jerez. And as everything arrives for those who know how to wait, the new course entered and the one of Granollers could prove that machine that so much wanted in May. If it meets expectations or not, it's a matter of time. Along with the team's growth, there is a "strong motivation" for Pol that arrives from the other side of the garage. Johann Zarco disembarks in the Austrian structure with the same mentality as the rest of the troops, they go for all in this new course. El Gaul will suffer the same adaptation process that Pol went through at the time since both arrived at KTM from the Yamaha satellite of Tech3. The last tests held in Sepang both offered a similar performance on a mount in which changes not only come from the members of the garage . The inertial platform (IMU), which until now was still the only item of free choice for equipment in the electronic apparatus, will also be homogeneous for all as of this season. The one that has been one of the points weak of the Austrian firm so far, comes reinforced with the incorporación new engineers with those who will try to reduce the differences they have compared to the rest of brands. Honda and Ducati are the ones that have performed the most in a section as important as that of electronics and in KTM are willing to take a step forward in this aspect to achieve the goal they have set for this season: return to podio. With the meat already put on the grill, from Mattighofen just need to find the point.